Good portability and an easy usability were only two of the design goals of the FX-9A, but also to manufacture an excellent receiver. 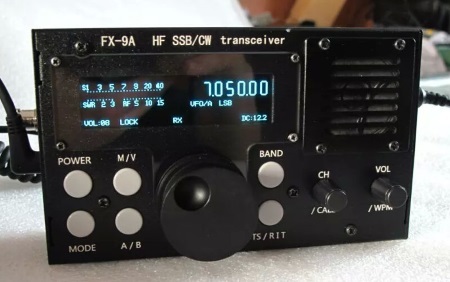 The QRP SSB/CW transceiver FX-9A by the chinese manufacturer Faymo offers 10 shortwave bands in a compact and rugged metal enclosure. The receiver does not offer continous coverage. This is due to the selective bandfilters, which are employed to achieve a good large signal handling capability. For most amateur radio bands the receive range extends slightly beyond the band limits, but not by much. The output power of the FX-9A can be set to "Hi" which offers 15W SSB PEP and 10W CW, or "Lo" (5W out). The supported modes are LSB, USB and CW. In CW mode the user can select between a wide and a narrow filter. An electronic keyer is built in and can be used with straight keys or paddles (Iambic mode A and B supported). The telegraphy speed is easily adjusted from the front panel. For good outdoor usability, the FX-9A QRP transceiver has a clear OLED display which is very good to read even in bright sunlight. The handling of the transceiver is very simple and uses six push buttons, two smaller rotating encoders/push buttons and one large VFO knob. The VFO encoder runs very smoothly and allows for precise adjustment of the frequency. A few parameters can be set via a simple menu system. 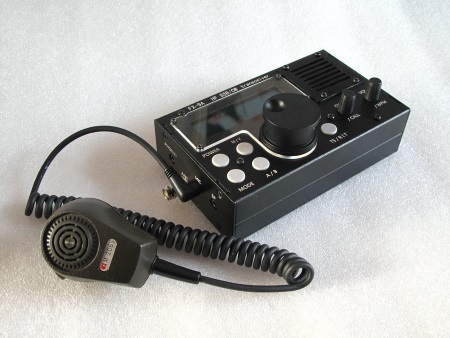 Small QRP Transceiver with excellent receiverDue to it's small size (only 100 x 160 x 48mm) and it's low weight (only 600g), the FX-9A QRP transceiver is very well suited for portable operations, e.g. SOTA. The power supply is done externally and requires 10 to 14V DC, a DC power cable is supplied. Current consumption is approx. 360mA during receive, and 3 to 4A during transmit. The antenna connector is a BNC female socket, other connections on the left side are for headphones, a speaker and the supplied handheld microphone. On the right side the connections for DC power, CW keyer and serial CAT interface are provided. The CAT interface can be used by programs like Ham radio Deluxe and many other applications.